Time to re-think your no-limits lifestyle? Nah. The Australian Macadamia Nut Oil, Jojoba-seed Oil and Avocado Oil (yes, the three of them! 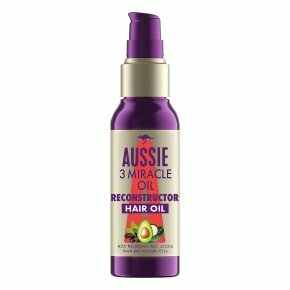 ), within Aussie 3 Miracles Oil Reconstructor's multitalented, non-greasy formula, visibly repair hair. No matter how much you overdo it, this handy little fixer will help your hair look silky, smooth and fabulously shiny. Pronto. A non-greasy oil formula that will visibly repair hair. Your hair will be smooth and shiny. With Australian Macadamia Nut Oil, Australian Jojoba Seed Oil, Avocado Oil. ?There's more to life than hair, but it's a good place to start? The Aussie Philosophy. Everybody needs this handy little fixer in their lives. Aussie's non-greasy formula, thanks to the multi-talented Australian Macadamia Nut Oil, Jojoba Seed Oil and Avocado Oil, will visibly repair hair. It?s like your fairy godmother in a bottle. Cinders, your hair will be smooth and shiny, come what may! There's no one, not two, but three ways to use this fabulous formula: before shampooing, on damp hair to help repair the smoothness and on dry hair for amazing shine effect. Three cheers for Oil Miracle! Hip-hip, hooray! Hip-hip? you get the idea.